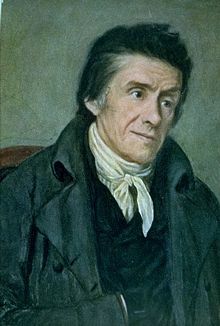 Johann Heinrich Pestalozzi (January 12, 1746 – February 17, 1827) was a Swiss pedagogue and educational reformer, who greatly influenced the development of the educational system in Europe and America. Not only was he an innovative teacher, but he was also committed to social reform, and carried out several humanitarian projects involving children orphaned during war. His educational method emphasizes the importance of providing a loving, family-type environment in which the child can grow and flourish naturally, becoming a whole person balancing their intellectual, physical, and technical abilities, with emotional, moral, ethical, and religious growth. According to Pestalozzi, when individuals are well educated in this way, social improvement and regeneration occurs. Although his ideas were adopted with considerable initial success in many parts of the world, the social problems he sought to solve continued, and even his own schools were unable to maintain the harmonious "family" atmosphere he advocated, finally closing due to bitter disputes and conflicts among the teachers that lasted several years. Without solving the problematic relationships within families, which, after his time, increasingly led to divorce and family breakdown, his educational method was doomed to suffer the same failures. Johann Heinrich Pestalozzi was born in Zürich, Switzerland on January 12, 1746. His father died when Johann was only five, and his mother raised Johann and his sister alone. Johann started his formal education rather late, at the age of nine, but successfully completed school on time. He initially enrolled to study ministry at the University of Zürich, but due to his shyness he decided to switch his major from theology to law. At the University of Zürich, Pestalozzi met Johann Kasper Lavater and the reform party. He entered the world of politics. However, the death of his friend Johann Kasper Bluntschli turned him from politics, and induced him to devote himself to education. Through his association with reformists, Pestalozzi had become aware of social problems, which helped him develop a deeper sense for human suffering. He began to research different ideas and schemes for improving the condition of the people. Influenced by the ideas of Jean-Jacques Rousseau to "go back to nature," Pestalozzi started a social experiment—he purchased a piece of waste land at Neuhof in Aargau, where he attempted to cultivate madder, a plant whose roots can be used as a source of red dye. His idea was to use this farm as a way of providing shelter and education for orphans. Pestalozzi married his childhood friend and they had their first child, Jacobi, soon after. He developed his teaching methods from teaching Jacobi based on Rousseau's ideas in Emile. His wife proved to be a “down-to-earth” woman, who helped her husband curb many of his impractical ideas. His social experiment with a group of orphans was successful for five whole years. Nevertheless, the project failed financially and the family went bankrupt in 1780. However, when everything looked hopeless, Elizabeth Naef, a neighbor, fortunately turned the whole farm project into a successful business and saved Pestalozzi’s project. In 1780, Pestalozzi wrote a series of reflections The Evening Hours of a Hermit, which outlined his basic theory that education begins at home and should occur naturally through direct experience. This was followed by his masterpiece, Leonard and Gertrude (1781), an account of the gradual reformation, first of a household, and then of a whole village, by the efforts of a good and devoted woman. This work became a bestseller in Germany, and the name of Pestalozzi became internationally recognized. The French invasion of Switzerland in 1798 brought into view Pestalozzi’s truly heroic character. A number of children were left in Stans, in Canton Unterwalden, on the shores of Lake Lucerne, without parents, home, food, or shelter. Pestalozzi gathered a number of them in a deserted convent, which he turned into an orphanage. During the winter he personally tended them with the utmost devotion, but in June 1799 the French reclaimed the building for use as a hospital, and the orphanage was closed. In 1799, Pestalozzi started yet another project. He volunteered his service as a teacher to the village of Burgdorf, where he used his own educational methods in his work with children. However, due to the non-traditional nature of his teaching, the villagers became suspicious of Pestalozzi’s success, with the result that he was compelled to open his own private school. In a short time, with two additional teachers, the school became the center of international attention and fame, and received government support. In 1801, Pestalozzi gave an exposition of his ideas on education in the book How Gertrude teaches her Children. In 1802, he went as deputy to Paris, and tried unsuccessfully to interest Napoleon I of France in a scheme of national education. In 1805, Pestalozzi moved his school to a castle at Yverdon, near Neuchâtel, and for 20 years he worked steadily on this project. It became famous worldwide, and he was visited by all who took an interest in education, including Charles Maurice de Talleyrand, Count Ioannis Antonios Kapodistrias, and Anne Louise Germaine de Staël. He was praised by Wilhelm von Humboldt and by Johann Gottlieb Fichte. Many visiting educators studied his methods and incorporated them into their own teaching, including Carl Ritter and Friedrich Fröbel. Educational systems in countries all over Europe were modified to reflect Pestalozzi’s ideas. As the Yverdon School grew in size, it lost its family spirit as some of the teachers changed Pestalozzi’s original ideas, which resulted in numerous quarrels and conflicts. After the school closed in 1826, Pestalozzi retired to his Neuhof farm, at the age of eighty. There, he wrote his last work, the Swan Song. He died soon after, on February 17, 1827. The goal of education is not to impart knowledge, but to unfold the natural faculties latent and hidden in every human being. In another words, educators need to focus on the human being, a child, and not on education per se. Pestalozzi presented two general purposes of education: for development of the individual and for the improvement of society. On the individual level, educators should strive to educate the whole child, not just their intellect. Physical or technical knowledge, as well as emotional development, are also important. He stressed that there should be balance between the head, hands, and heart, i.e. between intellectual knowledge (head), physical and technical education (hands), and moral and religious education (heart). Through developing a balance among these three areas, a person becomes a "whole man." On the social level, education provides the means for general development of the whole society. In other words, the more the individuals in a society develop intellectually, emotionally, morally, and socially through education, the more educated and regenerated the whole society becomes. For Pestalozzi, therefore, education plays a central role in the improvement of society. Pestalozzi asserted that education should be centered on the child, not the curriculum. Since knowledge lies within human beings, the purpose of teaching is to find the way to unfold that hidden knowledge. Pestalozzi advocated direct experience as the best method to accomplish this. He also advocated spontaneity and self-activity, in contrast to the rigid, teacher-centered, and curriculum-based methods used in other schools. Teachers should not teach through words (giving children ready-made answers), but allow children to discover answers themselves. Nothing is better than a direct sensory experience. Thus, in early education, Pestalozzi recommended that children use no books, but rather learn through direct experience. He advocated an inductive method, in which the child first learns to observe, to correct its own mistakes, and to analyze and describe the object of inquiry. The child starts with simple objects and simple observation, and builds toward more complex and abstract things. Only after that can the child start to use books. In order to allow children to obtain more experience from nature, Pestalozzi expanded the elementary school curriculum to include geography, natural science, fine art, and music. Pestalozzi maintained that the classroom should be like a family. The atmosphere must be loving and caring, like in a good Christian family, where the family members are cooperative, loving, and kind to one another. He developed the idea of the “family classroom” from the way his mother raised him and his sister. Pestalozzi said "There can be no doubt that within the living room of every household are united the basic elements of all true human education in its whole range" (Smith 2005). Family is thus, for Pestalozzi, an essential component of education. Based on this assumption, Pestalozzi suggested that teachers always need to be loving and kind, and earn the trust of the children. He believed that "without love, neither the physical nor the intellectual powers will develop naturally" (Smith 2005). He viewed harsh discipline, as was commonly used in schools at that time, as only serving to alienate children from the teachers, and thus prevent their normal, natural development, particularly in areas of morality and ethics. 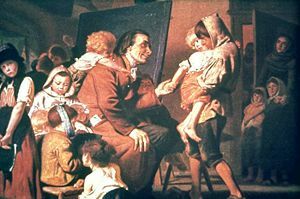 As Pestalozzi himself once said, the real work of his life did not lie in Burgdorf or Yverdon; it lay in the principles of education which he practiced, the development of his observation, the training of the whole man, the sympathetic application of the teacher to the taught, of which he left an example in his efforts at the orphanage in Stans. Pestalozzi not only inspired elementary school educators in Europe, but also impacted American education. The Normal School at Oswego, New York became the center of Pestalozzi education in the United States. An investigation by the National Educational Association in 1965 reported favorably on the results, and soon after, normal schools across the nation adopted the Oswego plan, based on his method. Pestalozzi had a profound effect on all branches of education, and his influence is far from being exhausted. However, his hope that this method of education would lead to the resolution of social problems and regeneration of society has not been realized. In fact, even his own schools failed and were closed after serious disputes erupted among the teachers—not exactly the loving family atmosphere he advocated. Unfortunately, there is a clear parallel between these problems in his schools and the problems within families, leading to family breakdown and divorce. In this case, it appears that the well-known sociologist Emile Durkheim was correct in his observation that education is a reflection of society, and so problems in education cannot be solved without first solving those problems in society. History of "Johann Heinrich Pestalozzi"
This page was last modified on 16 April 2015, at 21:12.